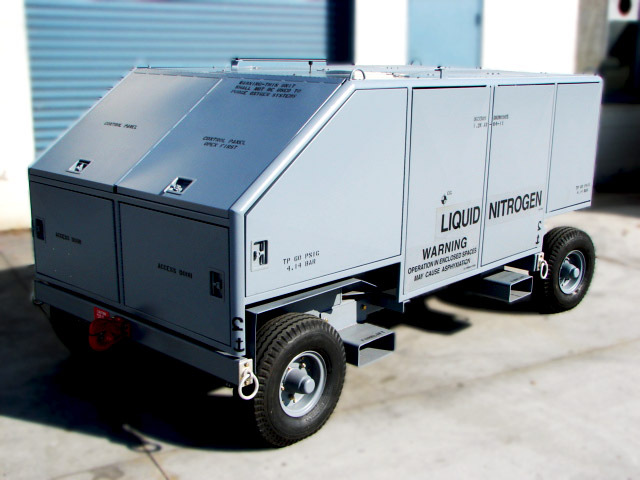 The DK Aerospace & Industrial Nitrogen Servicing Unit ( NSU ) is a portable liquid nitrogen servicing unit. Equipped with an on board 80 gallon liquid nitrogen dewar. This unit will deliver gaseous or liquid nitrogen at pressures up to 4000 psi from the standard unit, or 12,000 psi with the Ultra High Pressure option. Used for ground support of aircraft or other applications where gaseous or liquid nitrogen are utilized. Nitrogen is your wisest choice for filling tires, struts and accumulators. Your wisest choice for nitrogen is the DK Nitrogen Servicing Unit ( NSU ). When you save this much time and work, you save money. • Full pressure available continuously. • Safety ensured by burstdisks and relief valves. • Self contained -- no fuel, electricity, or charging. Two retractable 50-ft. hoses, using singly or simultaneously. • Low and high pressure circuits. • Unaffected by temperature or weather. • Totally air mobile in operating condition.